Monday before last, 5/1/2017, I got out after dinner to photograph Amtrak train #1 as it passed through. It’s usual time through my area is 7:30 PM, shortly before sunset at this time of year. Amtrak P42DC 150 leads the Sunset Limited at track speed as it passes MP 26 of UP’s Glidden sub at Sugar Land, Texas. A nice image, but nothing remarkable. At least not today. Which leads me to another image that was unremarkable shortly after it was made. Southern Pacific train #1, the Sunset Limited, is departing Alhambra, CA amid the lengthening shadows. #1’s scheduled time into Alhambra was 3:55 PM, putting sunset in Southern California less than an hour away on this clear mid-1950’s winter day. Nothing in image 2 was remarkable in the mid-50’s. 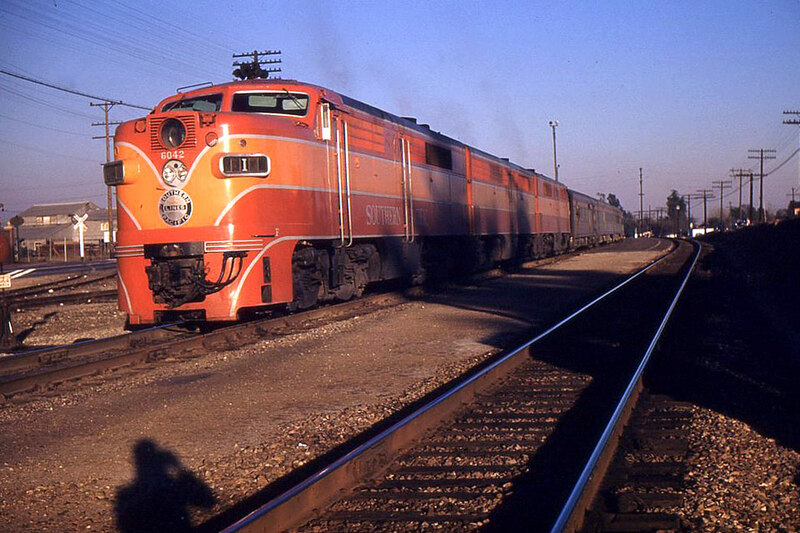 ALCO PA’s in the daylight-scheme were a daily occurrence. Just like Shamu-schemed P42’s are a daily (almost) event today. Will railfans in 2077 view P42’s the same way today’s railfans view the PA’s? Wondering how the “Daylight” colors would look like on a P-42.? Seems a modeler did that on an HO gauge models that was exhibited at a now defunct model shop on South Loop 610 and South Main in Houston a number of years ago. Bellaire Roundhouse. A blast from the past!